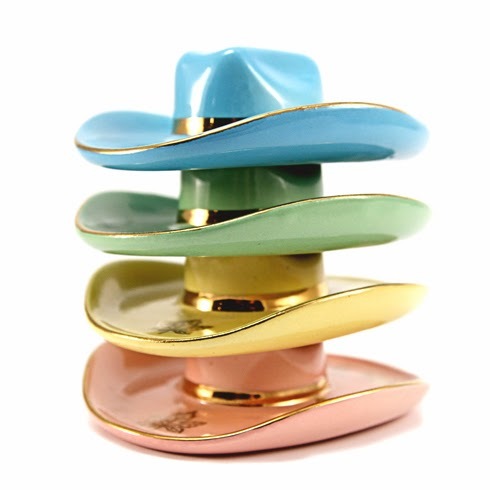 A few months ago I came across this set of four original Hycroft ceramic cowboy hats and couldn't pass up the opportunity to add them to collection. I know you're probably thinking what's the big deal about these kitschy hats? Let me tell you. 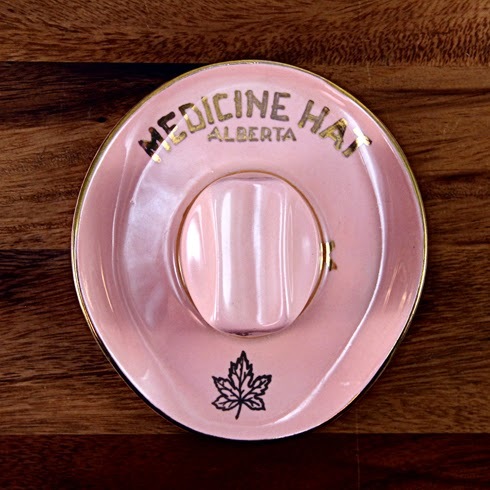 About a year ago I had been searching for one of these Hycroft hats that featured a standard Medicine Hat logo (unlike the numerous local businesses that put their logos on these hats back in the day). 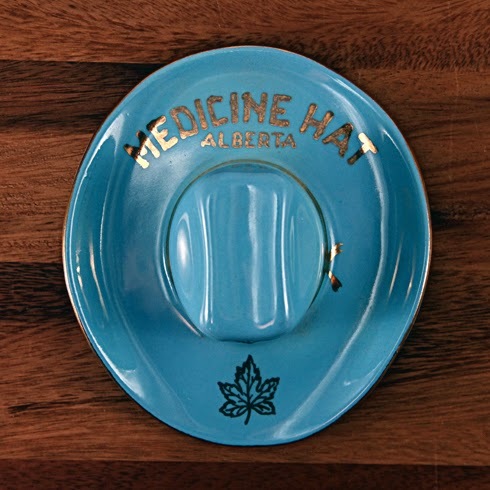 I finally found a pristine ceramic Hycroft hat in white after months of searching online. I eventually shared some pictures and posted about it here. I wanted one of these hats because after photographing so much of the abandoned Hycroft Factory here in Medicine Hat, I thought it would make a cool symbol for my Around the Hat photo series. 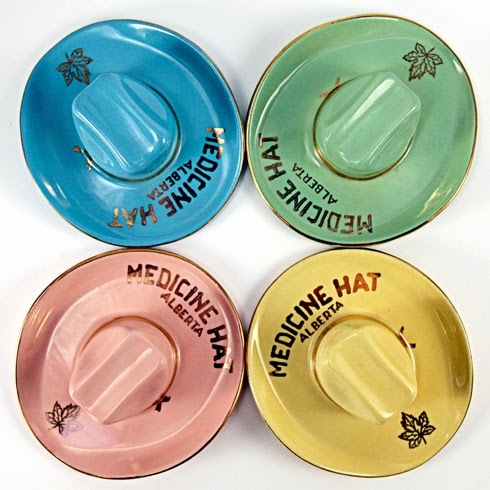 I never intended to collect any more of these Hycroft hats, but when I saw this set come up online it seemed like it had been custom tailored to me. 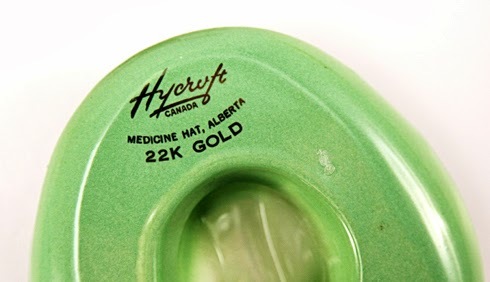 Not only were the four ceramic hats in the exact same design as the white one I had purchased a year earlier, but they were in the four other distinct Hycroft colours. 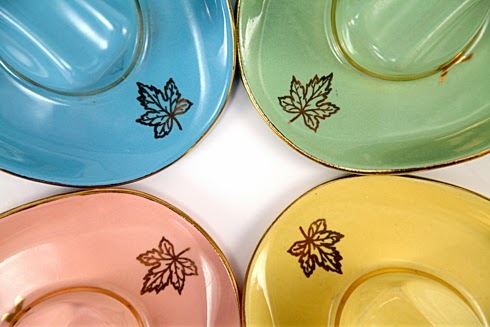 I snatched them up immediately, and almost by accident I'd acquired a complete set of this design in all colour variations (white, blue, green, yellow, and pink) from this now defunct local pottery manufacturer. As far as souvenirs from my hometown are concerned, I don't think they could get more stereotypical than this. It's probably why I love them so much. For as common as they once were 40 odd years ago, it's getting increasingly difficult to find these hats in good nick - without scuffs, chips, or the gold paint worn off. 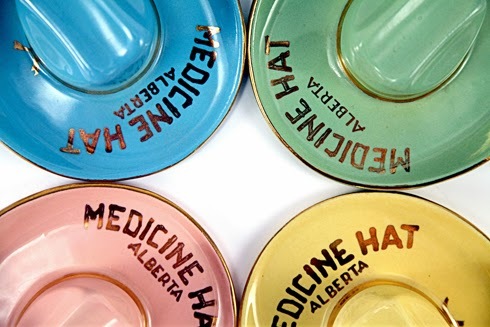 People liked to use them as ashtrays, so they were considered disposable for a long time. Plus, if there was a business logo on it, it really wasn't something you'd proudly display around the house. 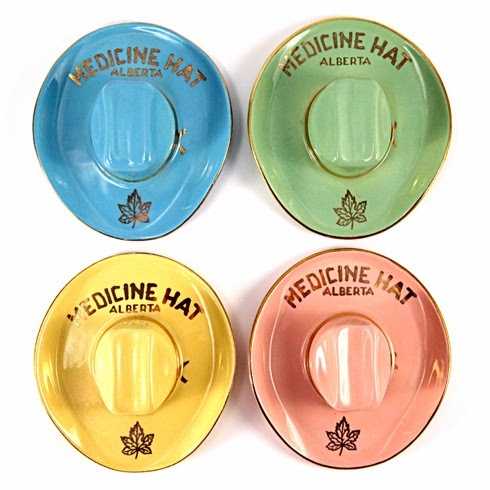 Despite all that, and probably after decades of hiding at the back of a dark cabinet, this set has survived and is now back in Medicine Hat looking as good as new. Thanks for the great post. 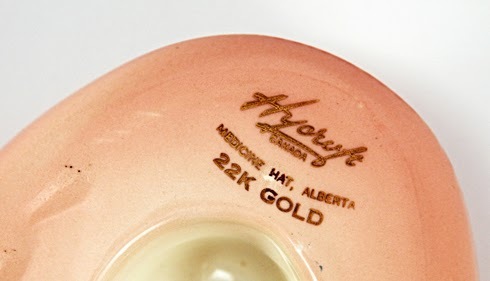 My Father, Louis Kohn was a partner with harry Veiner in Hycroft China for many years. 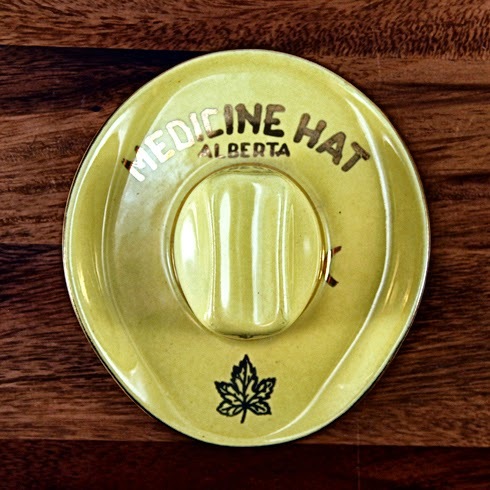 This particular hat design was modeled after my dad's "gentleman's Stetson" that he wore. 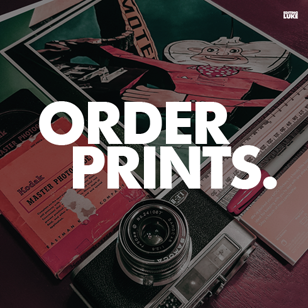 We have travelled extensively, and have found them all over Canada, and even in Montana.